Let’s take a negative and turn it into a positive. Isn’t that the saying we’ve heard all of our lives? The platitude is usually uttered from the mouths of parents or read in the latest hippie dippy new-age, self-help book. It also has invoked my wrath at points in my life but, I assure you, that day was not #BoycottBowl Sunday. It was beautiful and unforgettable. I hope you didn’t sleep on this amazing party that was appearing live all around the great city of New Orleans. It seems like every part of town had something going on and it was all about celebrating what makes this city so wonderfully diverse and all-for-one at the same time. I missed the early portions of the day as we have recently taken in an abandoned cat we named Percy. For most of the morning and early afternoon, I was chilling with Percy, who still needs quite a bit of care to get him back to perfect health. So, I smiled to myself when I picked up my phone to see quite a few “Where the hell are you?” messages. New Orleans was calling. I hit Magazine Street right as the Dat Dog party was breaking up and I migrated with the crowds downriver to Tracey’s Pub, my fave home for St. Patty’s Day festivities. Along the way I saw revelers trading jokes with police officers, my first coffin of the day and, in front of Rendezvous Tavern, a woman pushing a hog in a baby stroller. It seemed like the entire city was laughing and the sun was shining. That point struck me over and over again — everyone was laughing. As far as I can tell, on a day that saw thousands upon thousands of fans in the streets, there was no property damage, arrests or anything of that negative flavor. The city was out in force and as one. This city didn’t need any game to declare it victorious. We did it ourselves by hanging out with our neighbors, high fiving strangers and dancing in the streets. I’m still buzzing off of that vibe. Beer runs, finding forgotten bags of drinks and making plans for the inaugural, Feb. 15 Krewe Bohème parade were in order as early afternoon shifted to late afternoon. Tracey’s, as always, was packed and the overflow crowd spilled out onto Third Street. I was hanging with my homies from the Merry Antoinettes, playing catch up if you will, and had to keep reminding myself that this wasn’t Carnival or St. Patty’s Day. This was just another Sunday where the Big Easy decided to throw a party for itself and the team it loves. I can only imagine what the Saints players felt when they saw thousands of fans second lining down St. Peter’s in the Quarter. Then witnessing, with each social media post by fans, the party that was happening in all of the neighborhoods. I promise you L.A., a city 10 times the size of New Orleans, couldn’t bring together this type of crowd. Much less a crowd that was ready to dance and participate like their lives depended on it. About 4 p.m., my buddy Bill and I were having one of those serious New Orleans’ issues type of conversations. Should we stay at the party at Tracey’s or go to the party at the King Pin? Life sure can be difficult sometimes. 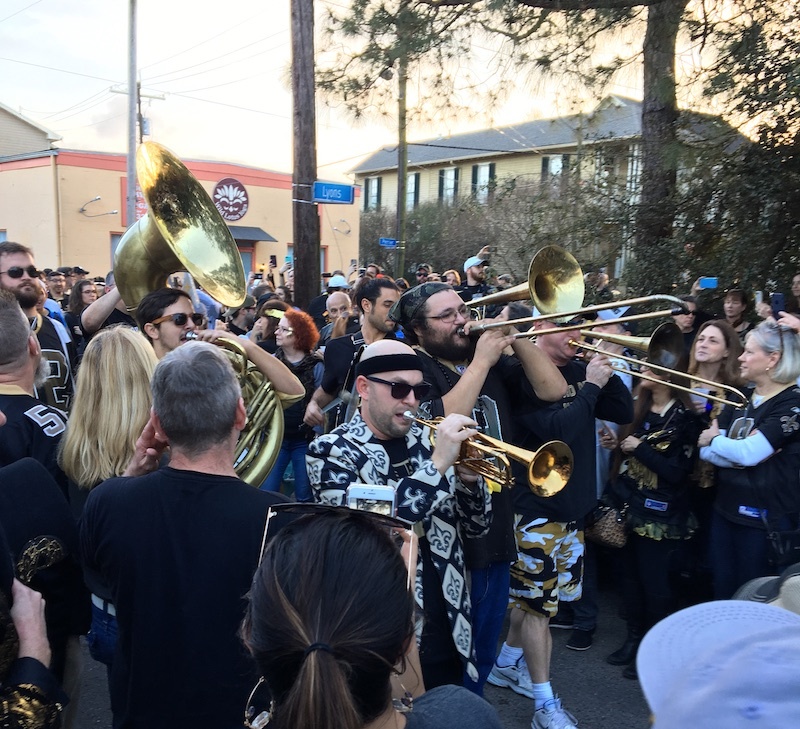 We decided there was no way we could walk to King Pin and make it in time for their second line. It was a smart move to Lyft, in many different ways. One being that I was just catching my groove and, had we walked, would have derailed our plans by stopping into Rendezvous Tavern. It is good to know thyself. Fortunately, one weird Lyft driver later, we were standing in front of King Pin with a throng, yes I said throng, of fellow Saints fans and met up with another group of Merry Antoinettes. As the day faded into night, everyone had that swagger and we all sang along to “I’ll Fly Away” and “When The Saints Go Marchin’ In” as I saw the second coffin of the day. Stranger conversations were had as we smiled along with our friends and talked about box cutters, mustaches and fluffy dogs. I even caught myself talking about Pre-Calculus at one point. Yeah, I don’t know either. With night upon us, two gents rolled up with a grocery cart and giant block rocker of a speaker and the dance was officially on. Big beats accompanied drunken dance moves and jumping, all of the jumping. The King Pin cranked up Super Bowl 44 and the party people inside the bar cheered along with every play as if it were live. A track by the grocery cart DJ had just ended as I heard a roar from inside the bar. Tracey Porter has just picked off Peyton Manning and returned the interception 74 yards for a touchdown to seal the victory. Two days from now will be the nine-year anniversary of the Saints Super Bowl victory. Two days from now will be the four-day anniversary of the Boycott Bowl. Both days were amazing. Both days brought the city out. I never saw one second of that other Super Bowl. If you read this blog on the regular, you know that I am a big-time fan of college baseball. With that said, I can’t say that I’ve ever seen a game live in New Orleans the first weekend of the season because of that little thing called Carnival. Whether I make it or not, the season kicks off on Feb. 15 with Tulane hosting George Washington and the UNO Privateers hosting Michigan State. Tulane’s second weekend goes big as the Green Wave hosts #10 Ole Miss. Let’s go to the park!